The best way to get to know a community is by scheduling a tour. See the facilities, meet the staff and residents, and get a feel first hand what it's like to live at Overture Domain 55+ Apartment Homes Independent Living. Overture Domain 55+ Apartment Homes is conveniently located in the heart of The Domain – the most desired place in Austin to shop, dine, live and work featuring over 100 upscale and mainstream retail stores, restaurants and four hotels. In addition, Overture Domain residents will enjoy over 13,000 square feet of indoor amenities within the community from Relish, our chef’s demonstration kitchen, daily fitness at Flex and Namaste, to Plunge our resort-style swimming pool, and so much more. Indulge in luxury 55+ living at Overture Domain. You’ve earned it. 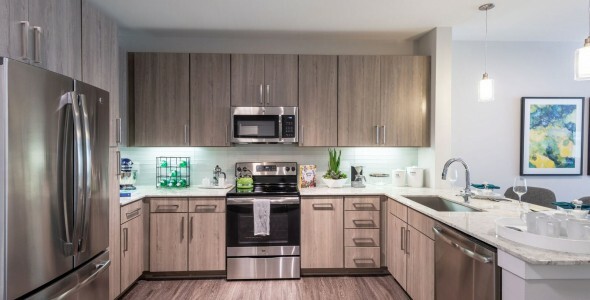 When you call Overture Domain 55+ Apartment Homes home you will wake up to an incredibly designed residence with designer finishes and fixtures. Each day you will be greeted by a stylish lobby, elegantly appointed furnishings, and an array of resort-inspired amenities, services, and activities. Venture beyond our doors, and you will find yourself surrounded by the Austin charm and choices. Before you go, our concierge would be delighted to help you complete your day.